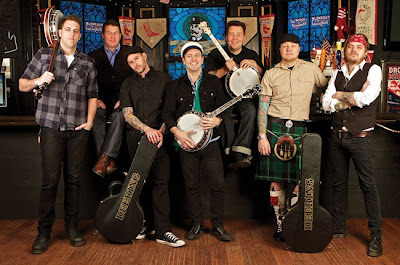 Ken Casey, bassist and founding member of Boston band Dropkick Murphys, spent the first part of his day on April 15 ignoring text messages and focusing on the Celtic rock troupe's concert that evening at the Catalyst in Santa Cruz, Calif. It was his birthday, so Casey figured most of the unread messages were well wishes that he could respond to later. As the texts began to pile up, he decided to read a few. Panic ensued. "My wife and kids were at the Red Sox game and that was ending," Casey recalls. "I didn't know whether they had gone down to the marathon after the game and I couldn't reach them." Casey's family wasn't harmed by the bombing that killed three and injured hundreds, but "we had a whole lot of connections to some of the victims," he says. In the hours following the bombing, the band started selling a T-shirt on its website that read "For Boston," with all proceeds going to the group's Claddagh Fund in an effort to aid victims. The T-shirt sales have raised $250,000, according to Casey. A couple of weeks later, the band returned to Boston for a show at the House of Blues, which raised more than $50,000 for bombing victims. Now, Dropkick Murphys have digitally released a three-song charity set, "Rose Tattoo: For Boston Charity," with 100% of sales proceeds going to the Claddagh Fund. In addition to live acoustic renditions of "Don't Tear Us Apart" and "Jimmy Collins' Wake," the release features a newly recorded version of "Rose Tattoo" (now featuring Bruce Springsteen), which debuted at No. 25 on Billboard's Rock Songs chart. The set has sold 20,000 copies, according to Nielsen SoundScan. Dropkick Murphys performed at the Boston Strong benefit concert at TD Garden on May 30, and hopes to assist Oklahoma tornado victims during its June 1 tour stop at Oklahoma City's Diamond Ballroom. "We're trying to figure out something creative to help those folks as well," Casey says. "It's just one thing after another."